It’s been said that a picture paints a thousand words. We agree… pictures tell stories. They capture a moment in time, preserving them for future generations. We love telling stories, preserving history and the part that pictures play in doing both. This is one of the reasons why we love Instagram. 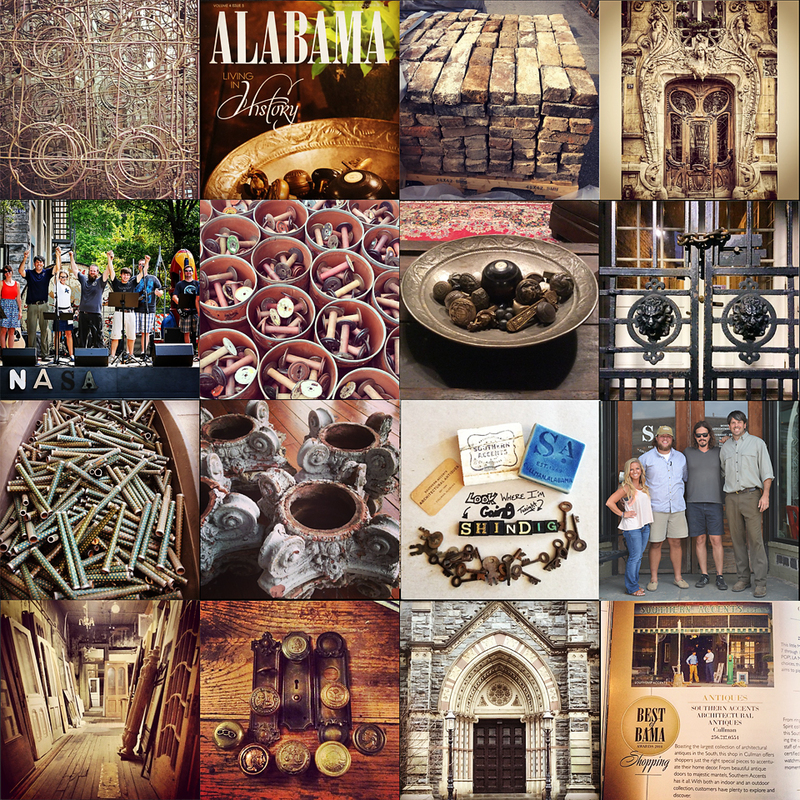 If you are on Instagram we would like for you to follow our Southern Accents adventures! If you are not on Instagram… what are you waiting for? In the past few months, Southern Accents has traveled to Nashville, Atlanta, Asheville, Washington D.C. and all over the state of Alabama. We’ve been featured in ALABAMA and NO’ALA Magazine, was a curator for Southern Makers, built a stage for “NASA On The Square” and created awards for Main Street Alabama. And… we’ve salvaged some pretty cool structures along the way! Following our Instagram feed gives you instant access via pictures to our latest travels, events, and salvage finds. To make it even more interesting… we are going to have a contest!! If you visit our showroom, see us at an event or out on the road, make sure you snap a pic, post and tag. If you have purchased from us in the past, we want you to post pictures of your finished projects. We love gorgeous architecture. Snap a picture of your favs and tag us so we can enjoy the view as well. We also love pictures of “forgotten” structures. Beautiful old homes, barns, and buildings that are time worn and have a story to tell. Each week we will pick one winner from all pictures tagged @saaa1969 and notify you by commenting on your post. Prizes will vary. The first prize is a $25 gift certificate. Winner will be announced on Tuesday, September 30th.If your picture screams Southern Accents… we want to see it! Ready, set, SNAP!! Southern Accents has several hashtags that we use on a regular basis. In addition to following @saaa1969, look up our frequently used hashtags! Through our recent involvement with the Southern Makers festival, we had the good fortune of getting to know Edwin Marty and his wife Andrea. Edwin is the executive director of E.A.T. South. Southern Makers was an event organized not only to celebrate the creative spirit of Alabama, but also as a way to raise funds for this non-profit organization. E.A.T. 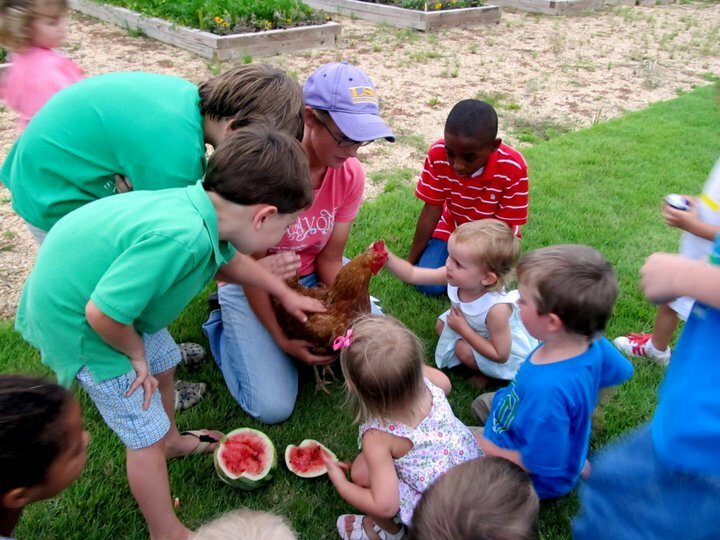 South’s mission is to teach children to eat with “intention”, encourage urban food production, and encourage the school systems to provide the best possible nutrition to its students by providing access to locally produced whole foods. One of the primary missions of Southern Accents is to educate people on the importance of historical preservation as well as the importance of salvaging and repurposing architectural materials. We are passionate about what we do. Upon our first meeting with Edwin, it was obvious that he shared that same level of passion for what he does. His mission of educating children on the benefits of healthy food choices as well as his promotion of urban food production is a worthy goal that we fully support. Not only are we both in the business of education, we also share a goal of making this world a better place to live by reducing some of the negative impacts on our environment. Our salvage operations reduce the amount of materials that are taken to our landfills. Edwin’s mission of promoting locally produced food reduces the need to have it transported from outside areas which has a positive impact on the environment. The primary message that Edwin wants to pass on to our readers is that fresh, healthy food can be the most affordable when purchased locally. 50% of the funds that support E.A.T. South come from donations. The rest come from grants, corporate sponsorships, program fees, the sale of produce grown on their two farms, and fund raising events like Southern Makers. If you would like to learn more about E.A.T. South or would like to make a donation to their worth wile cause, you can visit them at www.eatsouth.org. Southern Accents is proud to be a partner that shares it’s passion and resources with E.A.T. South! 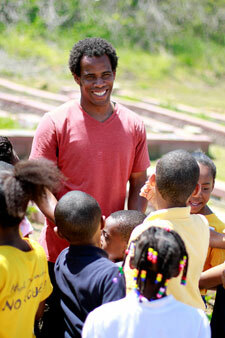 Edwin recently completed a book about urban farming in America called Breaking Through Concrete. This beautifully illustrated book documents twelve successful urban farm programs. 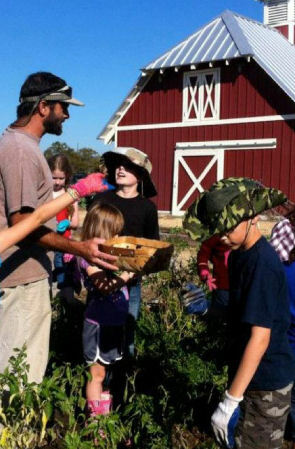 It also offers advice for budding farmers on topics including composting, keeping livestock in the city, decontaminating toxic soil, even changing zoning laws. This is an important book with practical application that explores a current environmental and social movement that has the potential to transform how we view our current food resources. WE ARE GIVING AWAY A COPY OF THIS BOOK! Visit our GIVEAWAY page and follow the easy Rafflecopter instructions to enter! You can also look for the GIVEAWAY TAB located on our Facebook page. Giveaway will run from 05/23/2013 until 12:00 am on 05/31/2013. Winner will be chosen at random and contacted via e-mail. Winner will have 24 hours to respond once contacted. Winner will be announced after entry requirements are verified. Giveaway is open to residents of the U. S. only. Congratulations to Sue Evans! Sue was chosen at random as the winner of our Breaking Through Concrete book giveaway. We had so much fun a couple of week’s ago at the Birmingham Home and Garden Show that we’ve decided to head north! 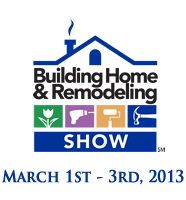 We will be at the Building, Home & Remodeling Show at the Von Braun Center in Huntsville, Alabama March 1 – 3. This show, in it’s 25th year, is hosted by the Huntsville Madison County Builders Association and is the premier event for building, remodeling, home and garden products in the North Alabama area. Each year this show brings consumers all the latest trends and technology for the home under one roof allowing them the opportunity to see, learn about and buy the latest products and services from reputable companies they can trust. This show occupies over 100,000 square feet of exhibit space in the South Hall and will feature over 200 companies making it the one-stop source for information, products and services for your home! Southern Accents is thrilled to be a participant in this year’s show. You will find us in booths 514/515. Visit the Building, Home & Remodeling Show website for detailed show information including a list of scheduled seminars for all three days. You can also print a coupon good for $1.00 off the price of admission as well as view a complete list of exhibitors. While you are there, make sure you stop by Southern Accents booths and take a look at our salvage wood floor, view our slide presentation of over 300 gorgeous pictures taken in our showroom, and sign up for our mailing list. We will have a few goodies to give away along with a chance each day to win a $50 gift certificate! We are looking forward to visiting with old friends and making new ones. We hope to see you there! We are often asked about our logo with customers wanting to know where they can purchase the letter photo prints. Our logo was created by Jan Shade Beach. Jan came to Southern Accents a couple of years ago and asked if she could take pictures around our store. In return, she created a Southern Accents print using pictures from her collection of letter photographs. We thought that the print was SO awesome that we decided to use it as our logo on the website. Jan recently opened an Etsy shop online where she is currently selling several beautiful prints using her letter photos. She is offering 8 different prints, each customizable. Even better… Jan has graciously offered to give one of her customizable prints away. One lucky customer will get to choose an 8″ x 10″ print from Jan’s Etsy shop selection and have it customized. This giveaway runs from December 13th till 12:00 am on December 20th. The winner will be chosen at random and will receive an 8″ x 10″ print of their choice from one of 8 designs currently available in Jan Shade Beach Designs Etsy Shop. Enter to win by following the easy Rafflecopter instructions on our GIVEAWAY page or click on the giveaway button located on our FACEBOOK PAGE. The winner will be chosen at random and contacted via e-mail. Winner will have 24 hours to respond once contacted. Winner will be announced after entry requirements are verified. Giveaway is open to residents of the U. S. only. This giveaway has ended. Congratulations to our winner Ana Rodriguez! We are giving away an original piece of artwork from artist Trés Taylor. Trés Taylor has been busy creating the Illuminated Chapel of William Guadalupe. The constructed chapel is covered in Golden Monks carved out of barn wood from Southern Accents. Trés has graciously offered us one of his barn wood Monks to give away! The Chapel is part of an installation called enCHANTment which features paintings by Trés Taylor and textile designs for the home by Tré Lilli. The first viewing was this past weekend but the show will travel to Jeannine Taylor’s Folk Art Gallery in Sanford, FL in January. Its not just an art show, its an experience. Enter the chapel of William Guadalupe and leave a painted prayer for him to deliver to heaven as he flies up on his bicycle. This original work measures 9″ wide by 46 1/4″ tall. CLICK HERE for an enlarged view. You can enter by visiting our GIVEAWAY page or look for the RED GIVEAWAY box on our Facebook page! Winners will be chosen at random and contacted via e-mail. Winners will have 24 hours to respond once e-mailed. This giveaway ends at midnight on December 12, 2012. Winner will be announced once we hear back from the chosen entrant and entry requirements are verified. Giveaway is open to residents of the U. S. only. For more information on the artwork of Trés Taylor, visit his website at www.trestaylor.com. THIS GIVEAWAY HAS ENDED. Congratulations to our winner Kelly Bressler from Duluth, Georgia. Good Monday morning! There’s nothing like having a few days off to spend with friends and family. Hopefully everyone is well fed and well rested after several days of Thanksgiving feasting and football festivities! Time to get back to business as usual as we begin the count down to Christmas! We have several fun giveaway’s planned between now and Christmas. The first is this beautiful Tré Lilli pillow that was graciously given to us by designer Lillis Taylor. Lillis is a native of Birmingham, Alabama. Lillis works with her father, artist Trés Taylor. Lillis takes images from a database of her father’s paintings. She then manipulates them in photoshop and digitally prints the images onto quality fabrics. Once printed, the fabrics are used to construct beautiful clothing, scarves, pillows and bags designed by Lillis. We are thrilled to be able to give away this pillow to one lucky winner. The pillow, which is a magnificent work of art, measures 14″ x 14″. The colors are bold and beautiful. Entries will be accepted through midnight Sunday, December 02. Winner will be randomly selected and contacted via e-mail on Monday, December 03. Winner will have 24 hours to respond before another name is selected. Winner will be announced on this blog post as well as our facebook page once we hear from the chosen entrant and entry requirements are confirmed. THIS CONTEST HAS ENDED. Congratulations to Cynthia Lehman of Huntsville, Alabama. Cynthia is the winner of our Tré Lilli Giveaway. Stuff the Stockings Giant Giveaway! Southern Accents is SO excited to participate in an exciting holiday giveaway!! Some of our favorite bloggers and friends of Southern Accents have teamed up with several other bloggers and sponsors for an incredible giveaway. They have collected over $2,000 in prizes and gift certificates. The prizes have been divided into 12 great prize packages that will be given away to 12 lucky winners on Cyber Monday, November 26th. Visit our friend Beth at Unskinny Boppy to view the prize packages and get the easy entry instructions! Our contribution of a fabulous hand crafted bead board Christmas Tree is included in prize package #10! Enter today and share this fun holiday giveaway with all your friends! THIS CONTEST HAS ENDED. Congratulations to Nicole Stoddard of Seattle, Washington! Nicole was the winner of the prize package that contained our salvaged wood Christmas Tree. 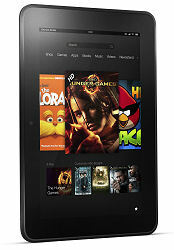 This is the last week to enter our KINDLE FIRE GIVEAWAY! Once you’ve subscribed to the newsletter and blog, return to the Giveaway page and let us know to register your entry. Please share this giveaway with ALL your friends!! Giveaway ends Friday, November 9th. Winner will be chosen at random and contacted via e-mail on Monday, November 11th. THIS CONTEST HAS ENDED. Congratulations to Clayton Warden of Huntsville, Alabama!! Clayton’s name was chosen at random as the winner of our Kindle Fire Giveaway! Make sure you are subscribed to this blog as well as our mailing list so that you will be the first to know about our next great giveaway! If you’ve been following our posts this week then you already know that we just got back with a trailer full of salvaged items from Philly! We’ve all been acting like children on Christmas morning around here!! The guys had goodies stuffed in drawers and all sorts of nooks and crannies. We’ve anxiously dug through the piles oohing and aahing over every new discovery. 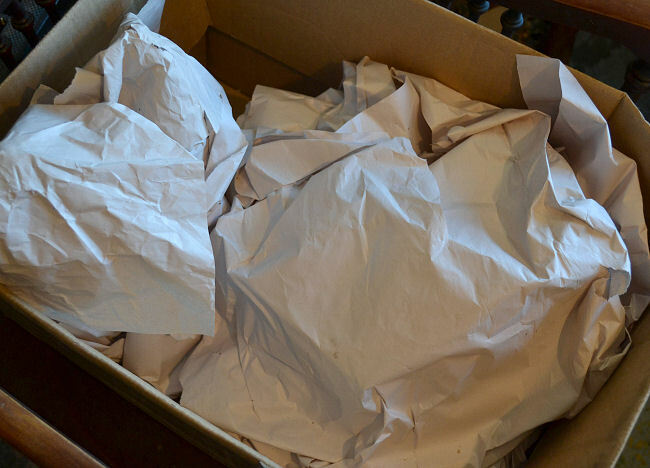 When I hopped up in the trailer I noticed a box full of paper wrapped items. I snapped a picture but did not have time at that moment to unwrap the presents inside. I thought about that box all night. The first thing I did the next morning was hunt it down in anticipation of what might be hidden inside. I then decided that it might be fun to play a guessing game with the box… so, here’s the box. Now comes the guessing game. Leave a comment below and tell me what you think is in the box! The only hint I can give is that there were three of these really cool items. The first person to correctly guess what’s in the box will win a $25 gift certificate to Southern Accents. You’ve got today and today only to post your guess. I will announce in the morning what was in the box and if we had a winner! Put your thinking caps on and guess away!!! 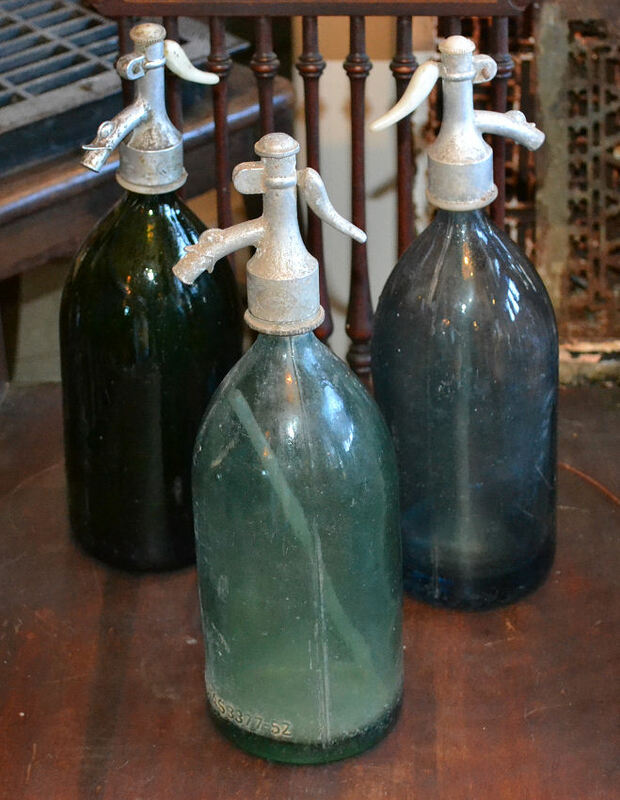 Three antique glass seltzer bottles! Thanks to everyone for playing along. I’ve posted these bottles on our website this morning. They can be found on the New Arrivals category. Give Away – $100 Gift Certificate! We’re giving away a $100 gift certificate to Southern Accents! You have the opportunity for two entries: Like Southern Accents on Facebook and Follow our Blog! Entering is easy! All you have to do is visit our WEBSITE or our FACEBOOK page. Click on the GIVEAWAY tab located on our front page or the red Giveaway box under the Southern Accents logo on our Facebook page. Follow the easy instructions to enter this giveaway! Don’t delay! Hurry on over to NOW to get your name in the pot! Once you’ve entered make sure that you share the love and tell all your friends! This giveaway will run through October 21st. Winner will be selected at random and contacted via e-mail. Winner will have 24 hours to respond to our e-mail. Once we hear from our winner we will announce the name on Facebook and on the blog. Gift certificate may be used for a merchandise purchase only. It can not be used for wood shop services, consignment items or shipping. Winner is responsible for shipping costs associated with purchase.